Amidst the burgeoning and prestigious community of Santa Luz sits Cavaillon, a decidedly upscale restaurant featuring regional gourmet cuisine from the South of France. I had learned in early April that Chef & Owner Philippe Verpiand would be offering a special foie gras menu for the month of May. Due to my insatiable penchant for these delectable bloated livers, no coercion was necessary to insure my presence on opening day. 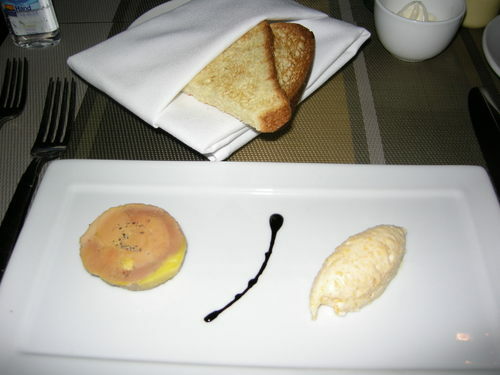 My first appetizer was Foie Gras "Au Torchon" ($22, foie gras menu). 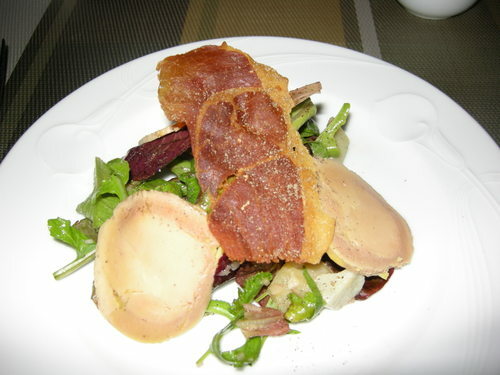 Chef Verpiand got the festivities started off on the right track, molding a whole lobe of foie gras in a towel, and subsequently poaching it in a house-made duck and pork stock mixture. A medallion is then sliced and paired with a mousseline of sweet dried apricot puree and whipping cream. Having spread some foie and mousseline on toasted brioche, I found myself transported to foodie Valhalla. My only problem with this heavenly starter was that I could have happily eaten three more. For an appetizer/salad, I selected the Purple Artichoke and Foie Gras Terrine ($19, foie gras menu). The torchon reappeared in this next offering shaved over tender purple artichokes hearts and an organic baby spring mix, topped with Serrano ham chips, and all finished with an aged balsamic vinaigrette. This creatively conceived study in exquisite tastes and textures played a perfect symphony on my palate. Soup fan that I am, I could not pass up the Red Beet Soup ($9, regular menu). 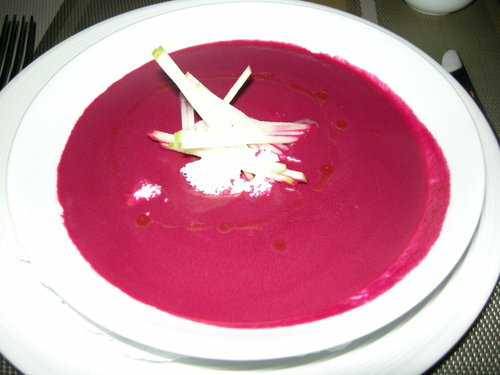 The beet soup includes julienne of green apple, goat cheese, and a drizzle of olive oil. This smooth, thick soup, full of concentrated flavor, struck me as the ultimate essence of beets. I can say without reservation that Chef Verpiand's rendition of this delicacy is the best that I have ever had. 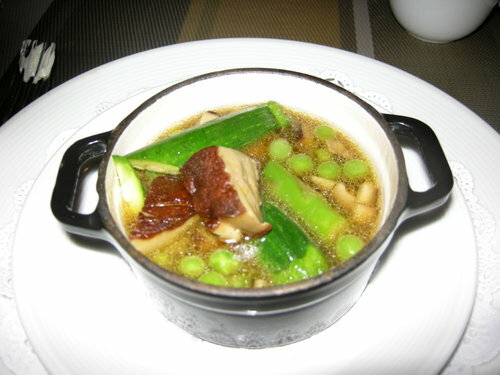 Another menu item I just had to try was Pot-Au-Feu ($21, foie gras menu). This course arrives at your table in a petite, cast iron, covered pot. When your server removes the lid, your olfactory senses are treated to a spellbinding aroma. The pot au feu consists of slow cooked duck stock combined with spring vegetables and diced seared foie gras, topped with black truffle oil. I loved the seared foie and fresh peas, but surprisingly, my favorite element was the rich and complex duck stock. I could fill a thermos with that stock, and nip away at it for hours. The high quality ingredients of this interactive presentation make for an excellent menu choice. As a preface to exploring my entree selections for the evening, I should explain that these dishes might have never been created, had it not been for famed nineteenth century operatic composer Gioachino Antonio Rossini. Following his great successes with The Barber of Seville and William Tell, Rossini retired at the age of thirty-seven, allowing him to travel the world in search of the finest, most decadent cuisines. Becoming an influential fixture on Europe's fine dining scene, the eponymous preparation of "a la Rossini" was created in his honor, featuring one of his favorite ingredients, foie gras. This guy was a man after my own heart, and a true foodie pioneer. While selecting my entree, I had an epiphany of sorts. Since I embrace all preparations Rossini, I thought why not order dueling Rossinis: one traditional, one a creative interpretation. The duel began with a traditional Beef Tenderloin a la Rossini ($38, regular menu). 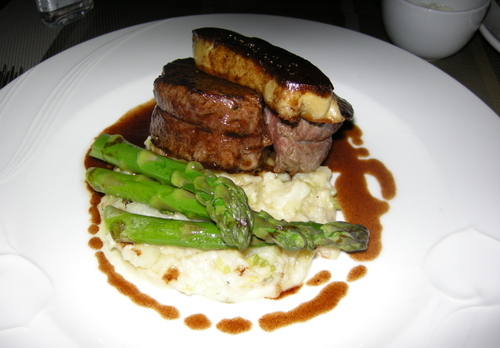 My first Rossini consisted of seared foie gras perched atop a USDA Prime beef tenderloin, drizzled with demi glace, and accompanied by porcini-grey shallot mashed potatoes and asparagus. As per my request, my steak was cooked to a perfect rare, and was complemented by a nice caramelized crust. The same held true for the generous slab of seared foie gras. What hit this dish out of the park however, was Chef Verpiand's flawless execution of his scratch-made demi glace. The complex, concentrated flavors of this classic french glace, which can literally take days to create, made for the perfect finish for this outstanding Rossini. The Duel continued with Chef Verpiand's creative interpretation, Maple Leaf Farms Duck Breast a la Rossini ($36, foie gras menu). This entree starts with a base of creamy bacon and leek potatoes, around which thick slices of roasted duck breast are arranged. Next, a slice of seared foie gras is placed on top of the assembled ingredients, all of which are finished with a port wine duck stock reduction. 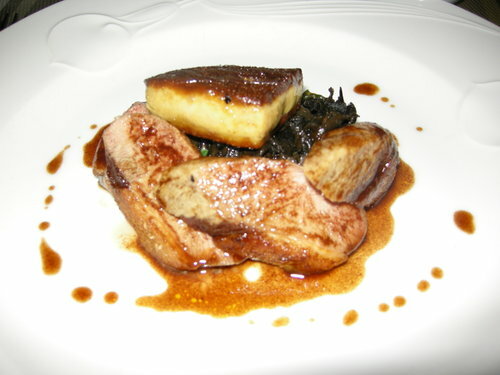 The duck breast was juicy and flavorful, and the foie gras was once again seared to perfection. Potatoes rife with sauteed leeks made for a tasty side dish. The wine fortified stock reduction played well as an interesting contrast to the previous dish's demi. While not as complex, it possessed a sweet component built up from the reduced port, which I found alluring. Rich and delicious, its flavors melded well with the duck breast. This is yet another excellent entree that should not be missed. Cavaillon strikes a lyrical chord on several fronts. The tastefully appointed dining room provides a pleasant environment in which to enjoy a fine meal without being overly pretentious. New Maitre d' Rick Rushing is a gracious and capable host, and manages the front of the restaurant with aplomb. Key modifications to the serving staff have pruned a controversial waiter, and on my visit the service was spot on. In the end, what impressed me the most was the fabulous food. Chef Philippe Verpiand orchestrates a kitchen operation that is hitting on all cylinders. No short cuts were taken, and every menu item that I ordered was flawlessly conceived and executed, using the freshest top shelf ingredients. 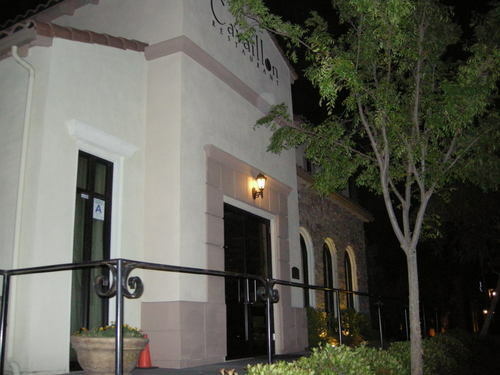 Cavaillon has immediately vaulted into my top tier rotation of San Diego fine dining destinations. Foie gras aficionados far and wide can rejoice, our beloved livers are given the royal treatment in Cavaillon's May celebration of gastronomical indulgence.